Lonicera involucrata, the bearberry honeysuckle, bracted honeysuckle, twinberry honeysuckle, Californian Honeysuckle, twin-berry, or black twinberry, is a species of honeysuckle native to northern and western North America, from southern Alaska east across boreal Canada to Quebec, and south through the western United States to California, and to Chihuahua in northwestern Mexico. 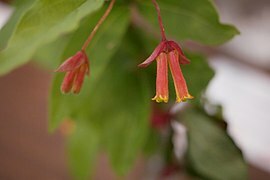 It grows at elevations from sea level to 2,900 m.
Lonicera involucrata var. involucrata. Most of the species' range, except as below; in California only in the Sierra Nevada. Leaves thin; flowers yellow. Lonicera involucrata var. ledebourii (Eschsch.) Jeps. Coastal California and southern Oregon. Leaves thick, leathery; flowers tinged orange to red outside. It is often used as an ornamental plant. It is resistant to air pollution, and can be kept in a large garden. It may be edible or very unpalatable, or even poisonous. 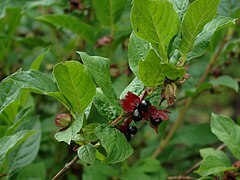 ^ "Lonicera involucrata". Germplasm Resources Information Network (GRIN). Agricultural Research Service (ARS), United States Department of Agriculture (USDA). Retrieved 8 January 2018. ^ Blanchan, N. (2005). Wild Flowers Worth Knowing. Project Gutenberg Literary Archive Foundation. ^ Darris, D. (2011). 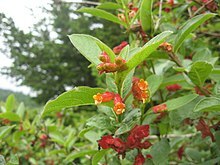 "Plant fact sheet for twinberry honeysuckle (Lonicera involucrata)" (PDF). USDA Natural Resources Conservation Service, Corvallis, OR. Wikimedia Commons has media related to Lonicera involucrata. This page was last edited on 16 January 2019, at 22:04 (UTC).